Ag-specific CD4+ T cells are present in peripheral blood in low frequency, where they undergo recruitment and expansion during immune responses and in the pathogenesis of numerous autoimmune diseases. MHC tetramers, which constitute a labeled MHC-peptide ligand suitable for binding to the Ag-specific receptor on T cells, provide a novel approach for the detection and characterization of such rare cells. In this study, we utilized this technology to identify HLA DQ-restricted Ag-specific T cells in the peripheral blood of human subjects and to identify immunodominant epitopes associated with viral infection. Peptides representing potential epitope regions of the VP16 protein from HSV-2 were loaded onto recombinant DQ0602 molecules to generate a panel of Ag-specific DQ0602 tetramers. VP16 Ag-specific DQ-restricted T cells were identified and expanded from the peripheral blood of HSV-2-infected individuals, representing two predominant epitope specificities. Although the VP16 369–380 peptide has a lower binding affinity for DQ0602 molecules than the VP16 33–52 peptide, T cells that recognized the VP16 369–380 peptide occurred at a much higher frequency than those that were specific for the VP16 33–52 peptide. The HLA class II molecules, DR, DQ, and DP, act as restriction elements for presentation of antigenic peptides to human CD4+ T cells. Techniques of T cell cloning and limiting dilution assays have been successfully applied to the detection and isolation of peripheral blood T cells that are restricted by HLA-DR molecules. T cells that are restricted by DQ and DP molecules generally occur at a lower frequency than those restricted by DR and are less well characterized. DQ-restricted T cells are of special interest in that autoimmune diseases including insulin-dependent diabetes mellitus, celiac disease, and pemphigus vulgaris are associated with specific HLA-DQ alleles (1, 2, 3, 4). Recently, MHC tetramer technology has been developed to detect T cells. This technology utilizes specific, labeled MHC-peptide complexes to detect Ag-specific T cells by direct binding of the TCR complex, with visualization by fluorescence flow cytometry. This has been successful in a variety of studies focused on the identification of CD8+ class I-restricted T cells (5, 6, 7, 8, 9, 10), whereas analysis of CD4+ class II-restricted T cells has been much more elusive. Most class II MHC tetramers studies are limited to murine class II molecules (11, 12, 13). Recently, we utilized DR tetramers to analyze human DR-restricted T cell responses to influenza A (14). The low frequency of Ag-specific peripheral T cells in humans and concerns related to the stability of soluble class II molecules have challenged the development of this technology, particularly with HLA-DQ molecules, in which the molecules are unstable compared with HLA-DR (15, 16). We now report the development of class II peptide-tetramers that detect human peripheral blood T cells restricted by HLA-DQ molecules in Ag-specific immune responses to HSV-2. Patients were HSV-2-infected individuals who visit the outpatient sexually transmitted disease clinics of the University of Washington Medical Center. HSV-2 infection was confirmed by HSV type-specific immunoblot (17). All patients were asymptomatic when their PBMC were obtained for these studies. HLA-DR and DQ typing were performed by reverse dot blot hybridization (18). PBMC from HSV-2-seropositive individual 5491 (HLA-DRB1*1501, *0301 and DQB1*0602, *0201) were plated at 2 × 106 cells/well in a 24-well plate in medium consisting of RPMI and 15% heat-inactivated pooled human serum. Cells were stimulated with VP16 protein (gift from Chiron, Emeryville CA) at 2 μg/ml. Starting on day 5, cells were fed every other day with fresh medium and IL-2 (Hemagen, Worcester MA) at a concentration of 16 U/ml. On day 12, cells were washed and plated at 1 cell/well in a 96-well U-bottom plate which also contained 1.5 × 105 irradiated (3300 rad) autologous PBMC and 0.8 μg/ml PHA. IL-2 was added 48 h later. At day 26, cells from each positive well were evaluated for Ag-specific proliferation in the presence of 2 μg/ml VP16 and L-243 (anti-DR) or SPVL-3 (anti-DQ) at 5 μg/ml, with 1 × 105 irradiated PBMC from an HLA haplotype-matched individual as APC (HLA-DRB1*0101, *1501 and DQB1*0501, *0602). After 48 h, [3H]thymidine (1 μCi/well) was added for 16 h, and cells were then harvested and counted. Cells that proliferated in the presence of L-243 and that were inhibited by SPVL-3 were selected for epitope specificity. For epitope studies, a panel of 60 peptides was used, each 20 aa long, which corresponded to the entire VP16 protein with a 12-aa overlap between adjacent peptides. The peptides were synthesized by Multipin peptide technology (Chiron Technologies, Clayton, Australia). For the proliferation assays, triplicate wells contained 104 T cells, 105 irradiated PBMC (DRB1*0101/1501, DQB1*0501/0602), and 1 μM peptide in 200 μl T cell medium in 96-well U-bottom plates. After 48 h, 1 μCi [3H]thymidine was added, and the cells were harvested and counted after an additional 16 h.
Chimeric cassettes containing the coding regions for the HLA-DQ extracellular domain/leucine zipper (LZ)3 molecules were made using a PCR-mediated splicing overlap extension technique (19). Plasmids pN15LZα and pLN15LZβ were gifts from Dr. D. Ostrov and Dr. S. Nathenson, Mt. Sinai Medical School (New York, NY). For generation of the soluble DQA1 chain, cDNA of DQA1*0102 was amplified in the first round using the primer pair, (+) 5′-GGAATTCATGATCCTAAACAAAGCTCT-3′ and (−) 5′-CCAGGTCTGCTGACGACTCTGTGAGCTCTGACATAG-3′ (sharing homology with the 5′ end of basic LZ) at a concentration of 4 nM for each primer. For the second round amplification, the first round product was used as the initial (+) primer on the pN15LZα template containing the basic LZ cDNA motif at a concentration of 10 pM to form a DQA1*0102/LZ chimera. The primer pair, (+) 5′-GGAATTCATGATCCTAAACAAAGCTCT-3′ and (−) 5′-CTGGTACCATCCTACTGGGCGAGTT-3′ (sharing homology with the 3′ end of LZ), was then used to amplify the chimera. The fragment was TA cloned into pCR2.1Topo (Invitrogen, San Diego, CA) sequenced and then subcloned into the metal inducible Drosophila expression vector pRmHa-3 (gift from Dr. L. S. B. Goldstein, Howard Hughes Medical Institute, La Jolla, CA) using EcoRI and KpnI sites engineered into the second round primer pair (underlined above). For generation of the soluble DQB1 chain, cDNA of DQB1*0602 was initially amplified using the primer pair, (+) 5′-ACCTCGAGGTCTCAATTATGTC-3′ and (−) 5′-CCAGGTCTGCTGACGACTTGCTCTGGGCAGA-3′ (sharing homology with the 5′ end of acidic LZ) at a concentration of 4 nM. For the second round amplification, the first round product was used as the initial (+) primer on the pN15LZβ template containing the acidic LZ cDNA motif at a concentration of 10 pM to form a DQB1*0602/LZ chimera. The primer pair, (+) 5′- ACCTCGAGGTCTCAATTATGTC-3′ and (−) 5′-ACAAGCTTCCCTGAGCCAGTTCCTTTTCC-3′ (sharing homology with the 3′ end of the acidic LZ), was then used to amplify the chimera. This DQ cassette was then cloned into vector pAC1 (Avidity, Denver, CO), using the XhoI and HindIII sites (underlined above), 5′ of the biotinylation sequence; the complete DQB1*0602-LZ biotinylation site cassette was then recovered by PCR amplification with the primer pair, (+) 5′-AGAATTCGTCTCAATTATGTCTTGGAA-3′ and 5′-CTGGTACCTTAGTGCCATTCGATTTTCTG-3′, and TA was cloned into pCR2.1Topo, sequenced, and then subcloned into the Drosophila expression vector pRmHa-3 using EcoRI and KpnI (sites underlined). The DQA1 and DQB1 chimeric cDNAs in the Schneider expression vector pRmHa-3 were cotransfected with the phshsneo plasmid (gift from Dr. M. McKeown, Salk Institute, San Diego, CA) into S-2 Schneider cells (gift from Dr. D. Zaller, Merck Research Laboratories, Rahway, NJ) by standard calcium phosphate transfection techniques. Cells were selected with G418 at 2 mg/ml (Life Technologies, Gaithersburg, MD). Cells were expanded and were grown to a density of 1 × 107 cells/ml. CuSO4 was added to a concentration of 1 mM to induce the production of class II molecules. The DQ0602 molecules from the supernatant were purified by affinity chromatography using SPVL-3 as previously described (20). The class II molecules were concentrated to 1–2 mg/ml and then dialyzed in 10 mM Tris (pH 8), 10 mM NaCl. The protein was then biotinylated by using the Bir A enzyme according to the manufacturer’s conditions (Avidity, Denver, CO). The excess biotin was removed by dialysis. The biotinylated DQ0602 molecules were then loaded with the appropriate peptides at a 10-fold molar excess of peptide over class II molecules. Loading was conducted at 37°C for 72 h in a 100 mM sodium phosphate buffer, pH 6, with 0.25% n-octylglucopyranoside (20). Class II tetramers were generated by incubating an 8-fold molar excess of loaded biotinylated class II molecules with PE-streptavidin (BioSource International, Camarillo, CA) at room temperature for 4 h.
T cell clones were incubated at 37°C for 1–2 h in 50 μl media with 20 μg/ml tetramers/5 × 105 cells. CD4-Cychrome or CD4-PerCP (PharMingen, San Diego, CA) was added at the end of tetramer staining and incubated for an additional 15 min at room temperature. The cells were washed twice with PBS + 1% FBS before analysis by a Becton Dickinson FACSort. For staining of PBMC, 2 × 106 nylon wool-purified T cells were stimulated with VP16 protein at 2 μg/ml with autologous adherent PBMC as APC. Adherent PBMC were prepared by plating out PBMC at 5 × 106 cells/well in a 24-well plate. Cells were allowed to adhere overnight, and nonadherent cells were removed with a plastic pipette. The nonadherent cells were passed through a nylon wool column, and cells eluted from the column were used as nylon wool-purified T cells. Starting at day 5, and every other day, IL-2 was added to a final concentration of 10 U/ml. The T cells were stained with DQ0602/peptide tetramers 10 days later. PBMC were stained with 0.8 μM 5- (and -6)-carboxyfluorescein diacetate succinimidyl ester (CFSE; Molecular Probes, Eugene, OR) for 10 min at 37°C. Staining was stopped by adding 100% FBS and subsequently washing the cells twice in RPMI culture media. Cells were then plated at 3 × 106 cells/well in 24-well plates and stimulated with 2 μg/ml VP16 protein overnight. Cells were stained for surface markers and with DQ0602/369–380 tetramers or control tetramers and analyzed by FACS after 10 days in culture. A portion of the CFSE-stained cells was polyclonally stimulated with 2.5 μg/ml PHA and 10 U IL-2 and also analyzed by FACS on day 10. Stimulation of T cells with PHA and IL-2 results in cell division with distinct CFSE fluorescence peaks, allowing determination of the mean CFSE fluorescence for each generation. These values were used to calculate the average number of cell divisions in cells stimulated with specific Ag. 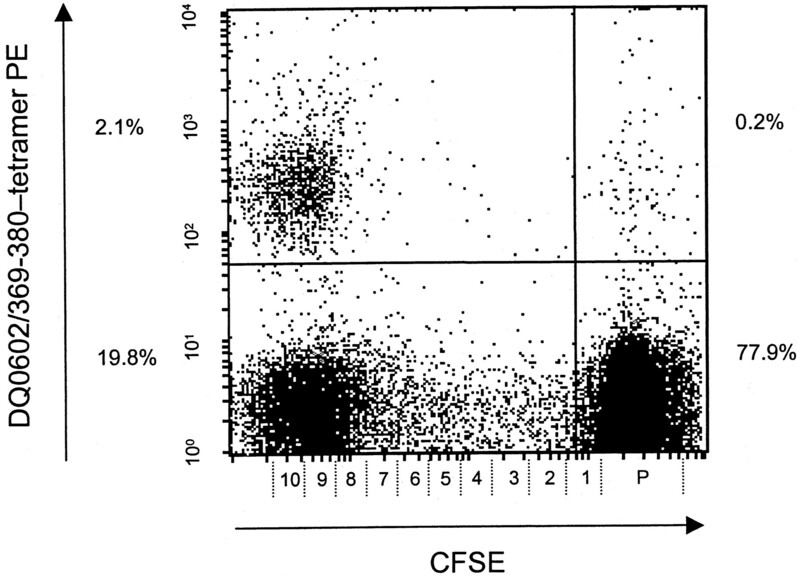 Precursor frequency was estimated by dividing the fraction of tetramer-positive cells by 2x, where x is the average number of cell divisions as calculated by CFSE fluorescence. Competition peptide binding assays with purified DQ0602 were conducted as previously described (20). The reaction mixtures consisted of 25 nM purified DQ0602, 0.1 μM biotinylated IA-2 499–509 peptide, and various concentrations of nonbiotinylated VP16 369–380 or VP16 33–52 peptides. The peptide/class II complexes were captured on a SPVL-3-coated plate and measured by a europium-labeled streptavidin assay using a Delfia 1232 fluorometer (Wallac, Gaithersburg, MD). The IC50 was determined by plotting a curve and extrapolating the concentration at which 50% inhibition occurs. mRNA was prepared from T cell clones using the Quick Prep Micro RNA Purification Kit (Pharmacia Biotech, Piscataway, NJ). cDNA synthesis was conducted using the Superscript Preamplification system (Life Technologies). TCR Vβ gene usage was determined by PCR amplification of cDNA using a set of 5′ Vβ 1–23 primers and 3′-constant region primers as described (21). The tegument protein VP16 of HSV-2 virus is one of the major proteins recognized as a viral Ag in HSV-2-infected subjects (22). Forty-eight T cell clones were isolated from peripheral blood of an HSV-2-infected individual that were specific for the HSV-2 VP16 protein. Proliferation assays in the presence of either an anti-DR or anti-DQ Ab indicated that seven of these clones were restricted by DQ0602, the only DQ molecule in common to both the responders and the APC (see Materials and Methods). Fig. 1⇓ illustrates the proliferation of two of these T cell clones, c5 and c44, in the presence of VP16 protein and BLS-DQ0602 B-lymphoblastoid cell line (LCL) as APC. The BLS-DQ0602 LCL is an EBV-transformed human B cell line that was transfected with DQ genes and had DQ0602 as the only expressed class II molecule (16), confirming that DQ0602 was the restriction element for these T cell clones. To determine the dominant DQ0602-restricted epitope for the VP16 protein, all 7 T cell clones were screened with a panel of 60 overlapping peptides that covered the entire VP16 protein. Six of the seven DQ-restricted clones, c5, c8, c31, c48, c68, and c73, were specific for both peptides 361–380 (AYSRGRTRNNYGSTIEGLLD) and 369–388 (NNYGSTIEGLLDLPDDDDAP). Truncation analysis of the peptides indicated that all 6 clones recognize peptide 369–380 (NNYGSTIEGLLD). The other clone, c44, was shown to recognize the VP16 peptide 33–52 (PPLYATGRLSQAQLMPSPPM). The reactivity profiles of clone c5 and c44 to the panel of overlapping VP16 peptides are shown in Fig. 2⇓. TCR Vβ transcripts in clones that recognized 369–380 were identified by RT-PCR analysis using a set of Vβ primers. Two different Vβ-chains were identified: clones c5, c8, c31, and c68 used Vβ 6.5; and clones c48 and c73 used Vβ 13.2. Identification of DQ0602-restricted T cells specific for HSV-2 VP16 protein. T cell clones that were isolated from 5491 were stimulated with 1 μg/ml VP16 with BLS.0602 LCL as APC. After 48 h, 1 μCi [3H]thymidine was added, and the cells were harvested and counted 16 h later. Identification of DQ0602-restricted epitopes in HSV-2 VP16 protein. T cell clone c5 and c44 were stimulated with 1 μg/ml VP16 protein or a panel of overlapping VP16 peptides, at 1 μM with HLA-DQ-matched PBMC as APC. After 48 h, 1 μCi [3H]thymidine was added, and the cells were harvested and counted 16 h later. DQ0602/peptide tetramers were generated with either the 33–52 peptide or the 369–380 peptide as described in Materials and Methods and incubated with T cell clones c5 and c44. As shown in Fig. 3⇓, tetramer staining was specific for T cells with corresponding functional specificity: Clone c5 T cells, which proliferated to peptide 369–380, could be stained only by the DQ0602 tetramers loaded with peptide 369–380 but not by the tetramers loaded with peptide 33–52, whereas clone c44 T cells, which proliferated to peptide 33–52, could be stained only by tetramers loaded with peptide 33–52. Staining of DQ0602-restricted T cell clones with DQ0602/peptide tetramers. A, Staining of c5 with DQ0602/369–380; B, staining of c5 with DQ0602/33–52. C, staining of c44 with DQ0602/369–380; D, staining of c44 with DQ0602/33–52. Peripheral blood lymphocytes from individual 5491 were incubated with VP16 protein in vitro and stained with the DQ0602/peptide tetramers 10 days later. T cells identified by both the DQ0602/369–380 and DQ0602/33–52 tetramers were detected (Fig. 4⇓, A and B). T cells that stained with the DQ0602/369–380 tetramers were observed at a higher frequency (3.3%) than the T cells stained with the DQ0602/33–52 tetramers (0.6%). This observation was consistent with the observation in T cell cloning that clones specific for epitope 369–380 were observed at a much higher frequency than the 33–52 epitope. Similar staining patterns with the DQ0602/369–380 tetramers were also observed with peripheral blood T cells from two additional HSV-2 infected individuals who carried the DQ0602 haplotype: 5624 (DRB1*1501/1101, DQB1*0602/0301) and 5633 (DRB1*1501/0801, DQB1*0602/0402) (Fig. 4⇓, C and D). T cells corresponding to the 33–52 epitope were not detected in these two individuals. Staining of DQ0602-restricted T cells from PBMC using specific tetramers. PBMC from DQ0602 HSV-2-infected patient 5491 were stimulated with VP16 protein and then stained with DQ0602/369–380 (A) or DQ0602/33–52 (B) tetramer 10 days later. PBMC from DQ0602 HSV-2-infected subjects, 5624 (C) and 5633 (D), were stained with DQ0602/369–380 tetramers. PBMC from a non DQ0602 HSV-2-infected subject 5707 (E) and a normal DQ0602 individual 5001 (F) were stained with DQ0602/369–380 tetramers. Percentages shown in the margins represent the percent of total cells present in each quadrant. Analysis with the DQ0602/369–380 and 33–52 tetramers was Ag and MHC specific. No staining with either tetramer was detected in HSV-2-infected individual 5707 (DRB1*0101/1101, DQB1*0501/0301) who did not carry the DQ0602 allele or in HLA-DQ0602 HSV-2 serological negative individual 5001 (DRB1*1501/0301, DQB1*0602/0201) (Fig. 4⇑, E and F). No staining was observed with tetramers that were loaded with a DQ0602 high binding affinity peptide, insulin B 5–15 (20) (data not shown). To estimate the initial frequency of DQ0602/369–380 T cells present in the peripheral blood of the HSV-2-infected individuals, we combined the use of specific tetramer staining with another fluorescent-based technique that quantitates cell divisions. As shown in Fig. 5⇓, after 10 days of culture, T cells from individual 5491 staining positive with DQ0602/369–380 tetramer are found predominantly in the CFSE-dull quadrant of the fluorescence profile. The mean CFSE fluorescence of these cells corresponds to ∼10 cell divisions. The observed frequency of 2.1% for tetramer-positive cells after 10 cell divisions indicates an initial precursor frequency of 0.002%. 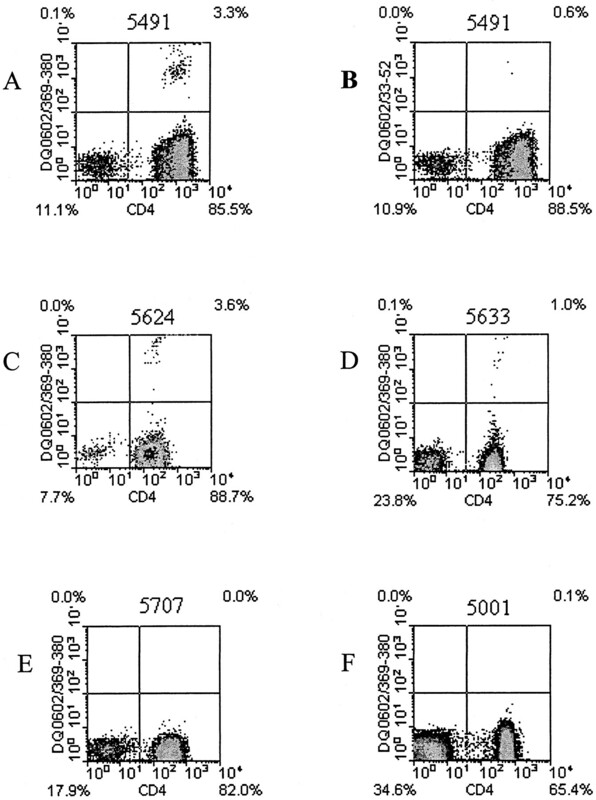 Proliferation of DQ0602/369–380 tetramer-positive T cells after VP16 Ag stimulation. PBMC from DQ0602 HSV-2-infected patient 5491 were stained with CFSE and stimulated with VP16 protein. After a 10-day culture, cells were stained for surface markers and with DQ0602/369–380 tetramer. Ordinate, PE fluorescence of the DQ0602/369–380 tetramer; abscissa, CFSE fluorescence over a 4-decade logarithmic scale. In addition, the abscissa shows the corresponding number of cell divisions, with P representing the undivided parent population. This scale was calculated from the distinct fluorescence peaks produced by polyclonal stimulation with PHA and IL-2 as described in the Materials and Methods. Percentages shown in the margins represent the percent of total cells present in each quadrant. Peptide binding studies for the DQ0602 molecule were performed to compare the class II-peptide avidity of the two VP16 epitopes, 369–380 and 33–52. As shown in Fig. 6⇓, peptide 369–380 has an IC50 of 2 μM, whereas peptide 33–52 has an IC50 of 0.4 μM. Because this binding avidity is inversely related to the frequency of epitope-specific T cells observed, this indicates that the relative higher frequency of 369–380 T cells was not directly due to a high affinity of 369–380 for DQ0602 but likely results from a more complex set of parameters associated with selection of immunodominant epitopes, possibly including differential T cell selection or variable processing of the VP16 protein, enabling the 369–380 epitope to be preferentially processed compared with the 33–52 epitope. This is compatible with x-ray crystallography structural studies in which the carboxyl-terminal region of the VP16 protein has a disordered structure (23), potentially allowing this region easy access to protease and capture by class II molecules. This is also consistent with a general property of this part of the VP16 molecule, rather than specific for DQ0602 determinant selection, because previous studies have also demonstrated that the carboxyl terminal of the VP16 contained numerous T cell epitopes (22). Binding of VP16 peptides to DQ0602. Purified DQ0602 (25 nM) was incubated with 0.1 μM biotinylated IA-2 499–509 in the presence of various concentrations of VP16 369–380 or VP16 33–52 peptides. Bound biotinylated peptide was detected by fluorescence using a europium-labeled streptavidin system with a Delfia 1232 fluorometer. The specificity of T cells detected with the DQ0602/369–380 tetramer was further confirmed by isolating the cells sorted by flow cytometry. T cells positively stained with the DQ0602/369–380 tetramer were FACS sorted and cloned at 3 cells/well; the sorted T cells were then expanded by PHA in the presence of IL-2 to generate 47 cell lines. Staining with tetramers and proliferation assays with the 369–380 peptide are summarized in Table I⇓. Thirty-six cell lines were positive for the staining and the proliferation assays; 11 lines were negative for both staining and the proliferation assays. Thus, 77% of the sorted T cells were specific for the VP16 369–380 peptide as assayed by tetramer staining and proliferation, compared with 2–3% T cells staining with the tetramer in the original unsorted sample. This confirms the Ag-specific properties of peripheral blood T cells detected using tetramer staining. The less then perfect correlation between the sorted cells and reactivity to the VP16 peptide was probably due to nonstringent fluorometry settings for the T cell population, which was gated for 1% positive cells. The overall fluorescence intensity as shown in Table I⇓ for these cell lines was variable, due to heterogeneity in the cell population. There was no correlation between the extent of proliferation and the intensity of the fluorescence signal. 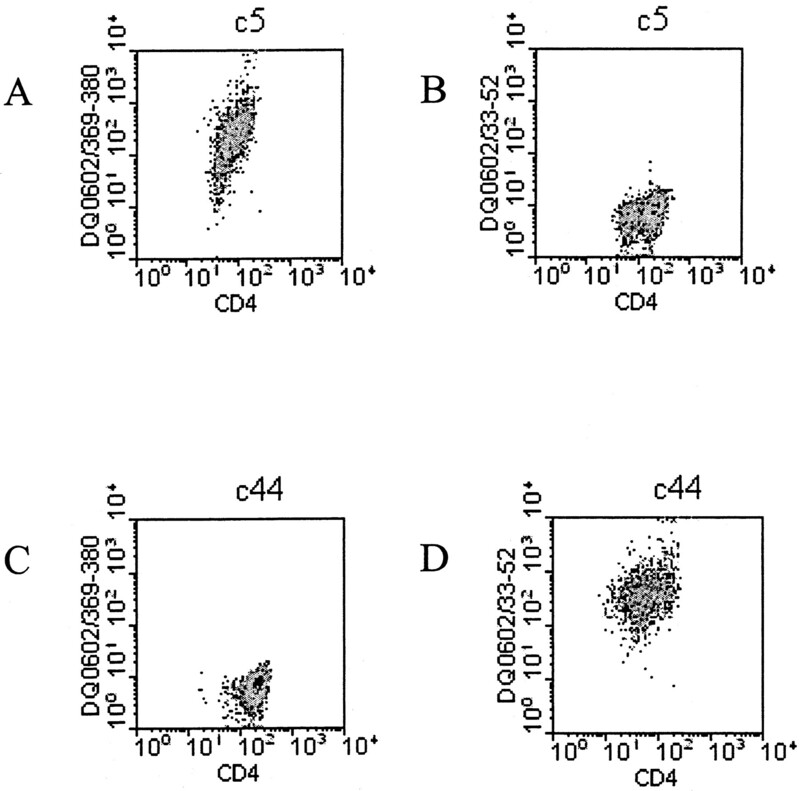 This study demonstrates the feasibility of using MHC class II tetramers to directly visualize a small cohort of Ag-specific DQ-restricted T cells from peripheral blood. A broad spectrum of class II tetrameric complexes can potentially be generated fairly easily by loading peptides into class II molecules by the technique illustrated. In this regard, this study is more similar to previous work with MHC class I tetramers, which are conventionally loaded with peptide during purification and refolding, and distinct from studies with murine class II tetramers which have utilized covalent peptide tethered to single MHC molecules (11, 12). Using specific tetramer detection, the precursor frequency of HSV-2-specific, DQ-restricted T cells was highest for the VP16 369–380 epitope compared with the 33–52 epitope, illustrating the importance of direct measurement of Ag-specific T cells compared with inferences about immunodominance derived solely from peptide-MHC binding studies. This study also demonstrates a rapid and sensitive approach for cloning specific T cells from human peripheral blood utilizing FACS sorting of tetramer-positive cells as a first step. In view of the limited data on DQ-restricted T cells, the use of tetrameric DQ reagents should provide valuable insight regarding the role of DQ-restricted CD4+ T cells in both abnormal and normal immune regulation. We thank Nicky Ducommun for manuscript preparation. ↵1 This work was supported by National Institutes of Health Grants AI44443 and DK02319 (W.W.K. ), DK49841 (G.T.N. ), and AI30717 and CA70017 (D.M.K.). ↵3 Abbreviations used in this paper: LZ, leucine zipper; CFSE, 5- (and -6)-carboxyfluorescein diacetate succinimidyl ester; LCL, lymphoblastoid cell line.